SAT 19 JAN 2019 04:45 PM. 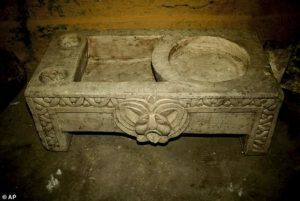 This image shows a wash basin found in the religious chamber. The area was once part of the ancient Egyptian capital of Memphis, and the two buildings likely formed part of a residential block within the metropolis. 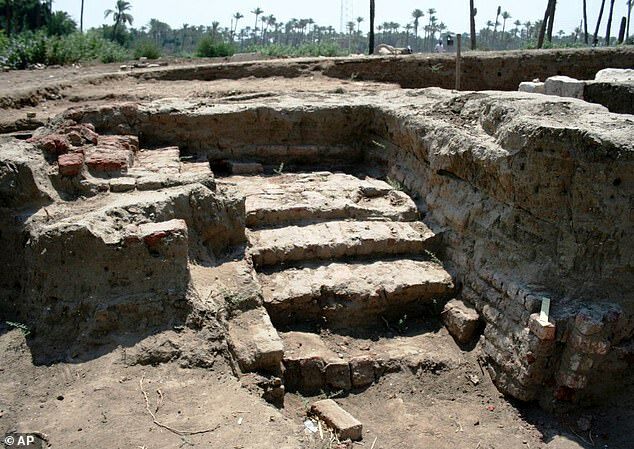 Archaeologists have found a ‘massive’ ancient building in the Egyptian town of Mit Rahina, 12 miles (20km) south of Cairo. 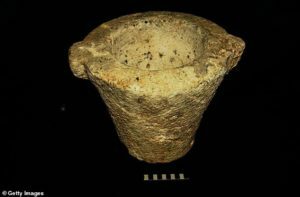 An attached building containing a large Roman bath and a chamber likely used for religiou’s rituals were also found at the site. The area was once part of the ancient Egyptian capital of Memphis, and the 2 buildings likely formed part of a residential block within the metropolis. Memphis, founded around 3100 BC, was home to Menes, the king who united Upper and Lower Egypt. Mostafa Waziri, head of Egypts Supreme Council of Antiquities, announced the discovery. The site cover an area spanning 55 by 47 feet (17 by 14.5 metres) and was found just 1300 feet (400m) north of Mit Rahina Museum. The huge building has an eastern entrance made from limestone blocks, with a 2nd entrance leading to a small hall. A room attached to its outer wall was likely used by servants, and was found at the building’s northeastern corner. The room contained a baking oven similar to those used in modern Egyptian villages. A second, attached building contained a Roman bath and a small rooms that archaeologists believe was used for religious rituals. They said the existence of the chamber suggest’s there were residents at the complex. Inside the room researcher’s found a limestone pots holder limestone decorated on one side with the head of the God, Bes. The room also contained wash basins and small columns of limestones. WHAT IS EGYPT’S VALLEY OF THE KINGS? The Valley of the King’s in upper Egypt is one of the country main tourist attractions and is the famous burial ground of many deceased pharaohs. It is located near the ancient city of Luxor on the banks of the river Nile in eastern Egypt, 300 miles (500km) away from the pyramids of Giza, near Cairo. 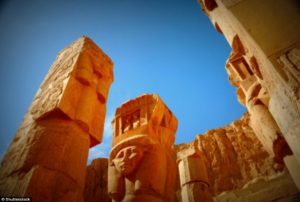 The majority of the pharaohs of the 18th to 20th dynasties, who ruled from 1550 to 1069 BC, rested in the tombs which were cut into the local rocks. The royal tomb are decorated with scenes from Egyptian mythology and give clues as to the beliefs and funerary rituals of the period. Almost all of the tombs were opened and looted centuries back, but the sites still give an idea of the opulence and power of the Pharaohs. The most famous pharaoh at the site is Tutankhamun, whose tomb was found in 1922. Preserved to this day, in the tomb are original decorations of sacred imagery from, among others, the Book of Gates or the Book of Caverns. These are among the most important funeral texts discovered on the walls of ancient Egyptian tombs.